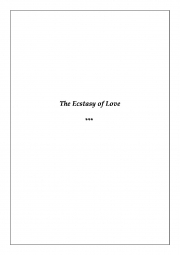 Description of "The Ecstasy of Love (eBook)"
The Ecstasy of Love is an interesting collection of emotions described eloquently by the author. It’s truly outstanding to pen down emotions in literature summarizing it all, highlighting the eternal love and wishes to the beloved. Reviews of "The Ecstasy of Love (eBook)"